The Range Rover SVAutobiography Dynamic will be designed and engineered by Jaguar Land Rover’s Special Vehicle Operations (SVO) team in UK and like other cars coming out of the SVO stable, this too will have high performance along with oozing luxury of the highest order. The Range Rover SVAutobiography Dynamic is the fourth vehicle in SVO’s India portfolio after Range Rover SVAutobiography, Range Rover Sport SVR and Jaguar F-Type SVR. It is powered by the 5.0-litre petrol V8 engine made fully of aluminium and is also supercharged. The engine is tuned to make 540bhp. All that power is sent to the wheels via an eight-speed automatic transmission. It also offers diamond quilted leather upholstery along with four choices for the interior colours and numerous premium and luxurious touches like a 10-inch touchscreen infotainment system and red key line at the rear door veneers. The cabin is definitely a fantastic place to be in. “We are excited to introduce the Range Rover SVAutobiography Dynamic in India. The Range Rover SVAutobiography Dynamic is designed and engineered by Jaguar Land Rover's Special Vehicle Operations (SVO) team who are passionate to explore new frontiers of luxury, performance and technology to deliver an unmatched experience to our discerning and equally passionate customers,” Rohit Suri, managing director at Jaguar Land Rover India, said. The exterior of the Range Rover SVAutobiography Dynamic gets 'Graphite atlas' accents with red Brembo calipers and exclusive alloy wheels. The company says that the Range Rover SVAutobiography Dynamic will be available to order at all its 25 Land Rover Dealerships in the country. Jaguar Land Rover Special Vehicle Operations (SVO) Technical Centre is located in the heart of the British Midlands. The innovative facility near Coventry is the headquarters of SVO and house manufacturing, paint, technical and customer commissioning and presentation zones inside the 20, 000 sq m facility. 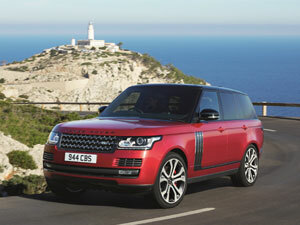 Range Rover Sport SVR is the world’s most capable performance SUV that is even more exhilarating, the company boasted.